Gold prices edged lower on Monday as Asian stocks gained, although political worries surrounding US President Donald Trump are expected to keep supporting appetite for the metal as a so-called safe-haven asset. 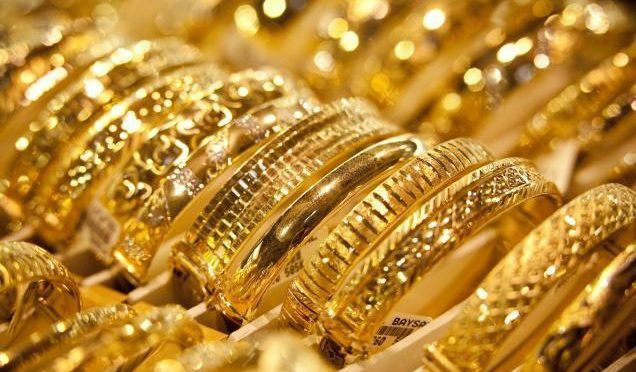 While 22k gold was priced at Dh142.50, 24k gold in Dubai can be bought at Dh151.75. Trump was hit on Friday by embarrassing leaks that a senior adviser was a “person of interest” in a probe of possible collusion with Russia during last year’s election campaign and that Trump had boasted to Russian officials of firing the man heading the investigation. Secretary of State Rex Tillerson and National Security Adviser H.R. McMaster defended Trump saying the president had raised the firing of the FBI director James Comey, in a meeting with Russia’s foreign minister to explain why he had been unable to find areas of cooperation with Moscow. Spot gold was down 0.2 percent at $1,252.46 per ounce by 0404 GMT. It rose about 0.7 percent on Friday. US gold futures were up 0.1 percent at $1,252.60 an ounce. “Some of that (weekend) risk hedging has been unwound in early Asia trading, with gold completely ignoring North Korea’s latest missile test,” said Jeffrey Halley, senior market analyst at OANDA. “(But) the geopolitical heat is definitely rising again slowly, and this should ensure that gold remains bids on any material dips in the early part of this week.” North Korea said on Monday it had successfully tested an intermediate-range ballistic missile to confirm the reliability of the late-stage guidance of the warhead. Asian stocks posted their biggest daily rise in a month on Monday following modest gains in US shares, with MSCI’s broadest index of Asia-Pacific shares outside Japan gaining 0.9 percent. The dollar held near six-month lows against a basket of currencies as investors assessed the impact of the political turmoil in the United States. “The outlook on gold remains relatively hazy at this juncture, given ongoing geopolitical concerns amid a likely rate-hike into the next month,” OCBC analyst Barnabas Gan said in a note. Higher interest rates tend to boost the dollar and push bond yields up, putting pressure on gold prices by increasing the opportunity cost of holding non-yielding bullion. Spot gold is expected to retrace to support at $1,245 per ounce, as it failed to break resistance at $1,257, said Reuters technical analyst Wang Tao. Hedge funds and other money managers cut their net long position in COMEX gold for the third week in the week ended May 16, taking it to a two-month low, US Commodity Futures Trading Commission (CFTC) data showed. Meanwhile, silver hit its highest since May 1 at $17.13 an ounce earlier in the session, before paring gains. Platinum fell 0.5 percent at $933.90 an ounce, while palladium shed 0.1 percent to $758.97.